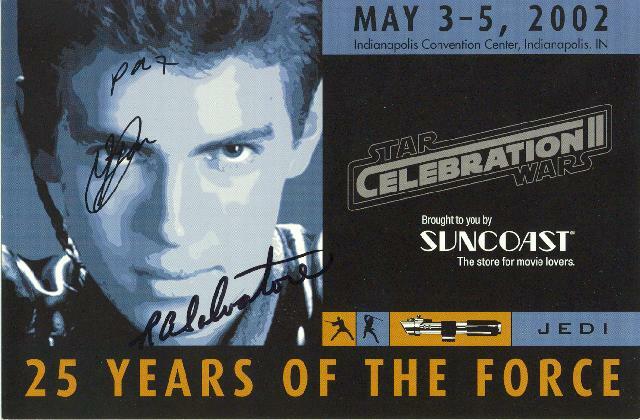 This weekend marks the 10th anniversary of Star Wars Celebration II. The event started on May 3, 2002 and went until May 5, 2002. I was there with my friend Jason Collier. Above is a card advertising the event. It’s autographed by Daniel Logan, the kid who played Boba Fett, and RA Salvatore who wrote the novelization. Jason and I also attended Star Wars Celebration I in Denver. 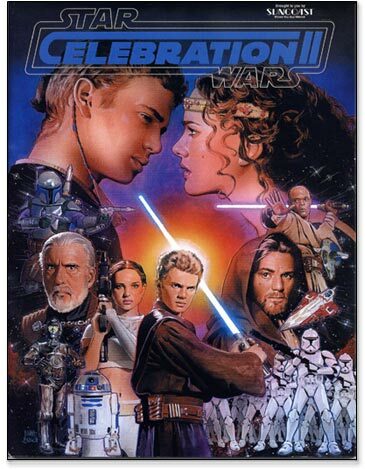 I talked about Celebration I on it’s 10th anniversary in 2009. So Celebration I was held in Denver. The powers-that-be decided to move it to what they thought was a more “central” location. 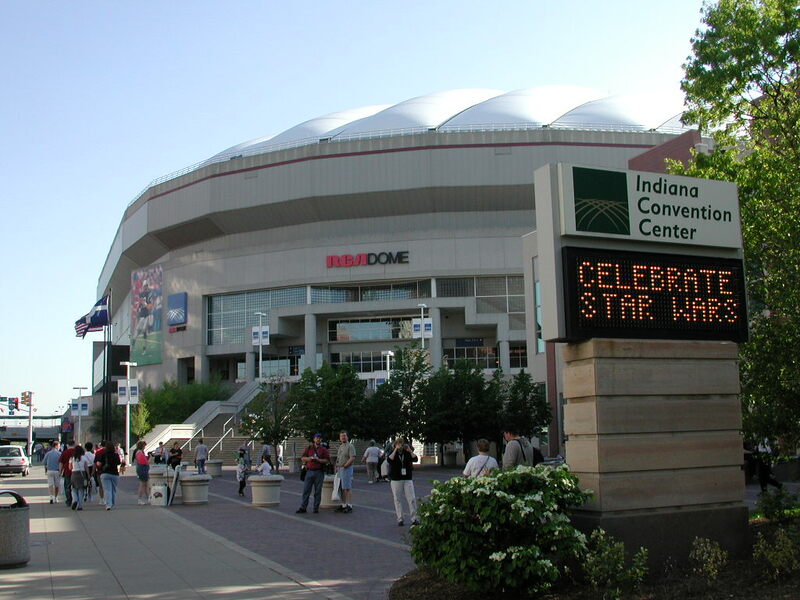 It was announced that Celebration II would be held at the RCA Dome in Indianapolis, IN. Honestly, I was a bit excited about the announcement. I’d never been to Indianapolis and I heard it was a really nice city. 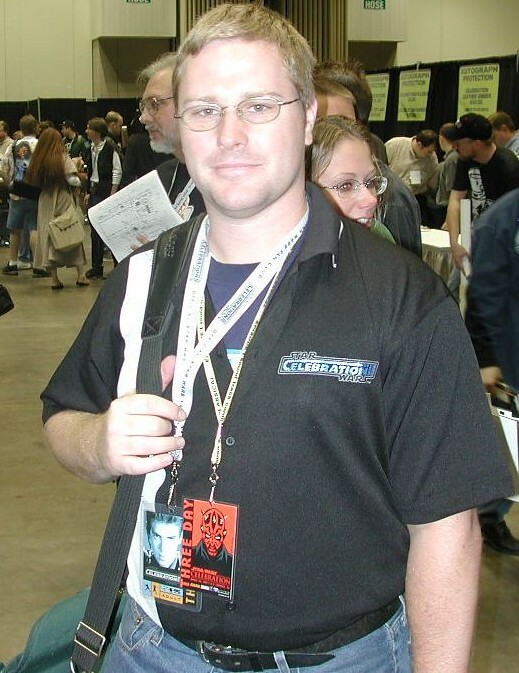 So with my wife’s blessings Jason and I planned our second trip to a Star Wars Celebration. Right away, this convention proved that it was going to be a lot more “formal” than the last convention. There was going to be a proper “Autograph Alley” where fans could get autographs of their favorite stars which Celebration I didn’t have. And there were going to be really big stars putting in appearances like Hayden Christensen, the newly minted Anakin Skywalker, Carrie Fisher, Billy Dee Williams and the return of Anthony Daniels as emcee of the festivities. Also, there was going to be a LOT more convention merchandise as well as an exclusive action figure developed to be sold only at Celebration. 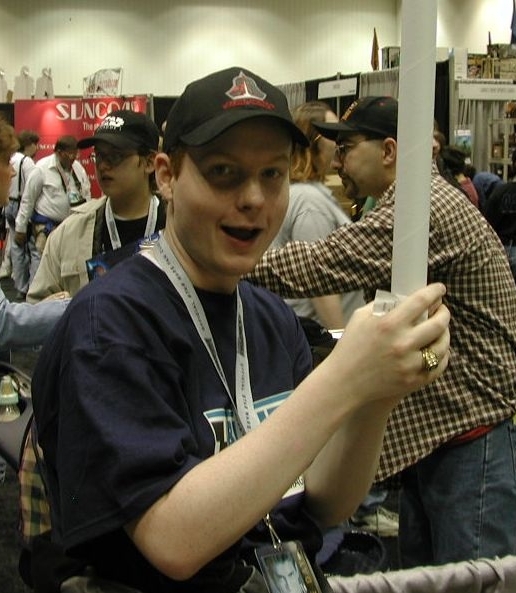 This Celebration was shaping up to be a “real” convention as opposed to the loose “gathering” of Celebration I.
Jason and I bought three days passes, which had a picture of Hayden as Anakin. Celebration I had Darth Maul on the three day pass. I took off work on Thursday and Friday and we arrived in Indianapolis on Thursday night and showed up at the convention several hours early on Friday morning. Here’s the front of the RCA Dome. I was able to catch it when the sign flashed up Star Wars. 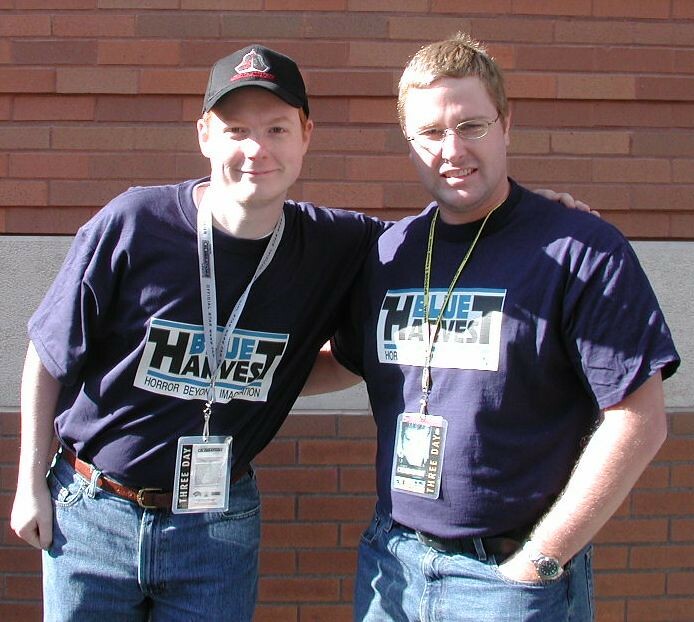 Here are Jason and I in line early on that first day. Jason mocked up our Blue Harvest shirts specifically for the convention. Once they finally let us in the front door, we had to literally run through the entire RCA Dome to the back where the Celebration Store was setup. We wanted to buy all of the exclusive Celebration merchandise immediately so we could take it to the car and not worry about it the rest of the weekend. I bought so much crap. Here’s the program from Celebration II. 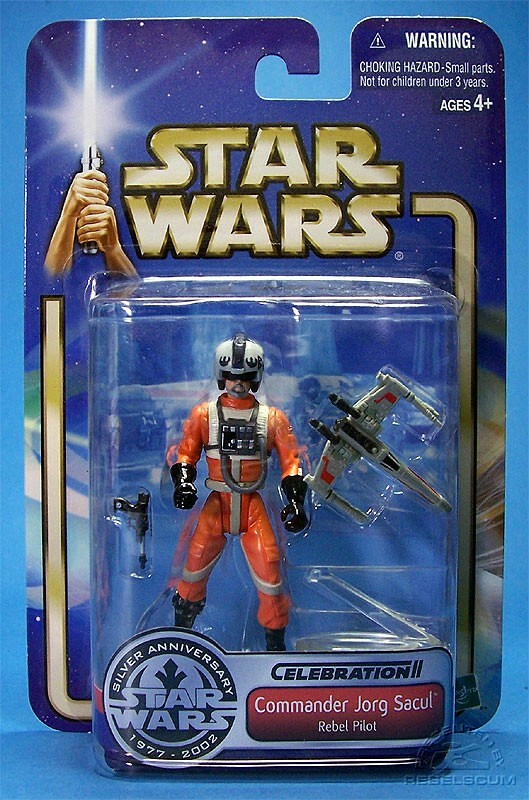 I also bought the exclusive Celebration figure, Commander Jorg Sacul (George Lucas spelled backwards). I even bought the leather bomber jacket with Jango Fett on the back. I mainly bought that jacket because I had purchased the black Darth Maul leather jacket from Celebration I and didn’t want it to be lonely. I still have both of these jackets hanging in my closet at home. My wife hates that they are still in the house. HATES. IT. Here are some pics of Jason and I on the Celebration floor. 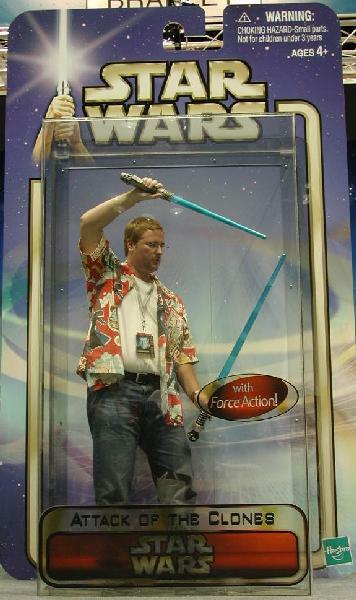 Here I am in a life-size action figure card. Here’s a cool group pic of all the attending members of the Fighting 501st costuming group. I believe this was taken on Saturday afternoon. It was a fun event and I’m really glad I was able to go. Unfortunately, I have not been able to attend any Celebration event since. 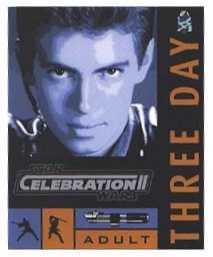 I missed Celebration III because I had just moved to a new job and couldn’t get the days off. However, Celebration is going to be in Orlando this year so I may try to make the trip for the day as I’m only 2.5 hours away. We’ll see. Stay tuned, I fully intend for this feature, Star Wars Roadtrips, to be a regular feature. I’ve been a lot of places around the country having to do with to visit things having to do with Star Wars so I want to feature some of those places every once in a while. Star Wars Roadtrips will be a subset of a larger feature called Nerdy Roadtrips in which I’ll look at various movie/TV/pop culture related places I’ve visited. Keep an eye out on my Flickr stream. I’ll be updating my Star Wars Celebration II set with more pics as I find them. This entry was posted on May 3, 2012 at 8:00 am and is filed under movies, pop culture, Star Wars with tags anniversaries, anniversary, conventions, Indiana, Indianapolis, pop culture, roadtrip, Star Wars, Star Wars Celebration, Star Wars Roadtrip. You can follow any responses to this entry through the RSS 2.0 feed. You can skip to the end and leave a response. Pinging is currently not allowed. 10 years? That makes me feel old. Seems that you’re entire blog makes me feel old!! May the Fourth be with you Pax. Good times my friend! I actually got rid of my Jackets on Ebay a year or so back. My wife hated them too! Awesome! I bet that was a wonderful experience!